Where does one start on such a subject in 500-1000 words, I wonder? I’ll try! There are many benefits to be derived from staying fit or physically active later in life. I consider physical fitness to be an extension of mental and spiritual fitness, and vice versa. To exercise, or exert yourself safely and effectively, requires a certain skill set, but first let me list some of the benefits of consistent physical activity as one ages. Hi! from FitOldDog!(Kevin). Damn, 70 next month! Your body will be less fragile, and thus less likely to break in response to load or during life’s little and not so little accidents. The explanation for this is provided in one of the most remarkable images I have ever seen, an MRI (magnetic resonance image) of the mid thigh region of three individuals. Study the image below. It says it all! 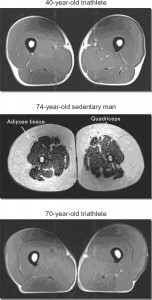 MRI scans of the thigh of a 40-year-old triathlete, a 74-year-old sedentary man and a 70-year-old triathlete. The 74-year-old exhibits loss of muscle (grey), which has been replaced extensively by fat (white). You are able to do more things. If I weren’t a strong swimmer, for instance, I wouldn’t have enjoyed the chance to meet a pod of wild dolphins up close and personal in the open ocean in Hawaii a few years ago, or to see whales in the Sea of Cortez with my youngest son, Nigel, at the Los Cabos Ironman, in which we both competed (Nigel did better than I in that one!). You get to see lots of interesting stuff firsthand, which is far better than watching someone else enjoy it on television (haven’t had one of those life-suffocating machines for almost 40 years, thank goodness). Hello. I couldn’t agree more. 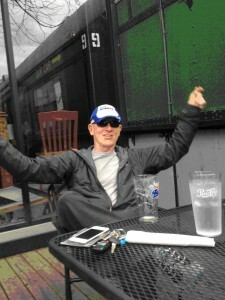 I’m soon to be 69 and participate in Masters’ Track and Field, as well as 5k and 5mile road races. How many people look forward to reaching the next 5-year milestone? Folks like me who want to be the “baby” in the age category…….have to wait a year to be at the bottom of the 70-74 bracket. I too have become very aware of my body and any changes. My runner’s knee acts up sometimes, but ice and compression take care of that quickly. However, a torn muscle in my gluteous maximus that I suffered during a 10k race was a whole other story. For that, I needed serious rest and PT……but I knew right away it was serious. I also know now that 5 miles is my distance limit. Safety, as you point out, is highly important.